It has been ten years since Kumeka, Master of the Eighth Ray, introduced himself to Diana Cooper and began to meld his consciousness with hers. 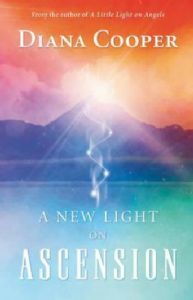 A Little Light on Ascension presented the information he impressed on Diana at the time, but since then, much has changed on our planet, and Kumeka has recently imparted further information. This knowledge, previ­ously offered to just a few, is now available to millions of lightworkers eager to assist in the task of moving this planet into the light. Yes, ascending into the higher realms can be achieved in this lifetime. We may have to work at it, but all the tools and information we need are now available to us thanks to A New Light on Ascension. However, be pre­pared, this journey is not for the fainthearted! Kumeka does not offer a quick fix; he invites and encourages each one of us to join the millions on the planet now actively working towards a joyful life of spirit. "Diana Cooper's A Little Light on Ascension is the bool that reminds me why I am here and what it is all about. To say I find it an inspiration is an understatement; to describe is as my bible would not be an exaggeration." Diana Cooper is the principal of the Diana Cooper School of Angels and Ascension, which organizes Angel Awareness Day and offers certificated teach­ing courses. She has helped countless people find their life's mission, to fulfil their potential and empower their lives. She is also the author/creator of The Keys to the Universe, 2012 and Beyond, The Atlantis Cards, TheWonder of Unicorns, En­lightenment through Orbs, Ascension through Orbs, The Orbs Cards, and many other titles.